Years of debunking Russian propaganda are finally starting to bear fruit. Lawmakers, politicians and everyday citizens are becoming increasingly more aware of deceptions, misrepresentations and outright fabrications utilized by the Russian fake-makers to advance their domestic and international agenda. 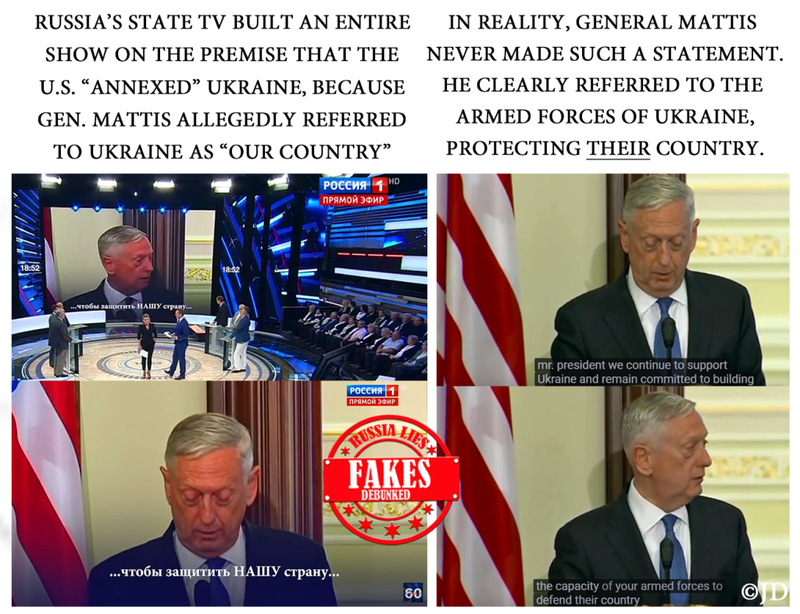 Without further ado, here is another compilation of the most notable lies spawned by the Russian state media and government officials. At first, many assumed Zakharova was referring to the previously-debunked, Photoshopped images of Hillary Clinton and Osama Bin Laden, featured in “Russia’s Top 260 Lies” as No. 255. 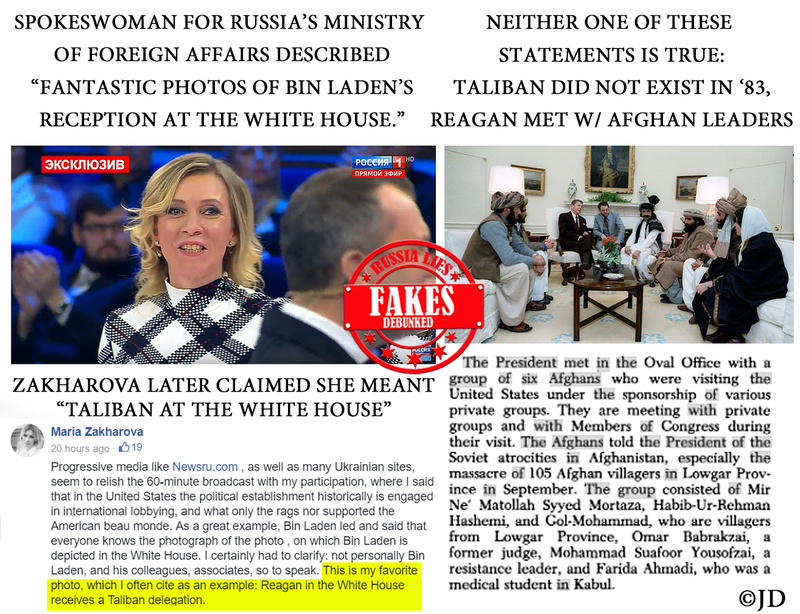 However, Zakharova later claimed she was referring to the photos of “Reagan receiving Taliban leaders in the White House.” This claim also doesn’t hold water. Reagan received Afghan rebel leaders in 1983 – when the Taliban did not yet exist – to discuss the Soviet presence in Afghanistan. The group included three villagers from Lowgar province, a former Judge, one resistance leader and a female medical student from Kabul. 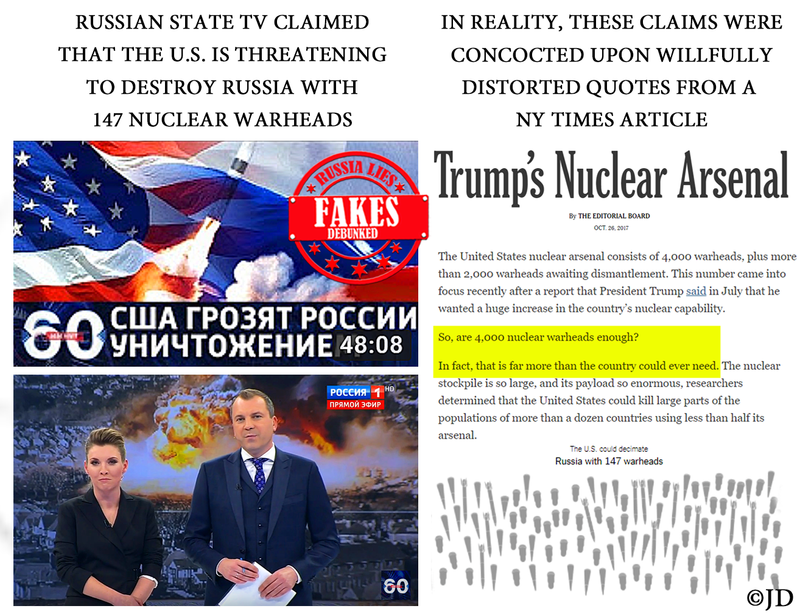 TV Hosts of Russia’s state TV program, ’60 Minutes,” Evgeny Popov and Olga Skabeeva, claimed that the U.S. is “plotting to destroy Russia with 147 nuclear warheads.” As the proof, the hosts produced the numbers from a NY Times article, while failing to elaborate as to its real content. Far from “plotting to destroy Russia,” the article bemoaned excessive numbers of warheads in our nuclear stockpile – far more than the country could or would ever need. U.S. officials have packed the Russian archives on their own and moved them to Washington, where they were returned to the Russian Embassy. 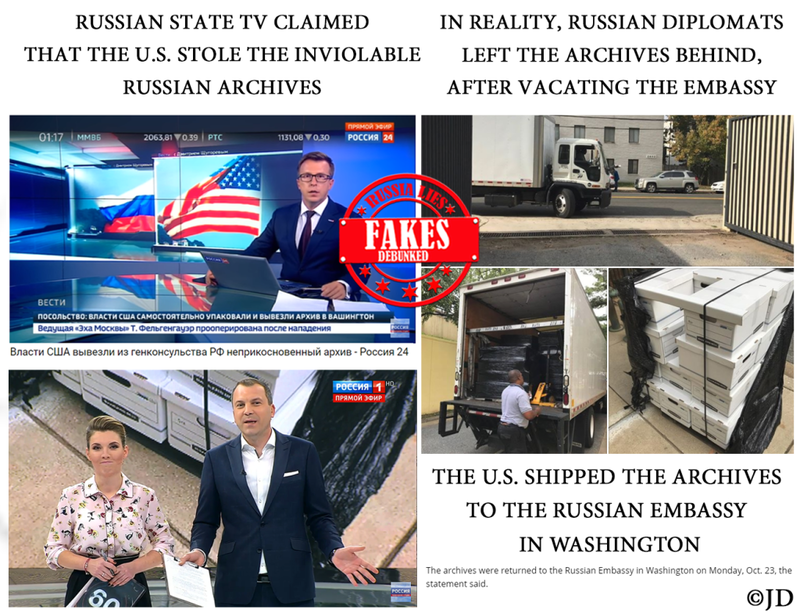 At the time the Russian state TV was alleging “theft” of diplomatic archives, they had been already returned to the custody of the Russian diplomatic mission. Russia’s Ministry of Defense and Russian state TV published what it described as “irrefutable evidence” that the U.S. is covertly supporting ISIS. Attached images were promptly identified by Bellingcat and The Conflict Intelligence Team as screenshots from a YouTube demo of the video game, ‘AC-130 Gunship Simulator: Special Ops Squadron.’ Other images were ID’d as footage from a June 2016 Iraqi Ministry of Defense video, showing Iraqi Air Force bombing ISIS near Fallujah. 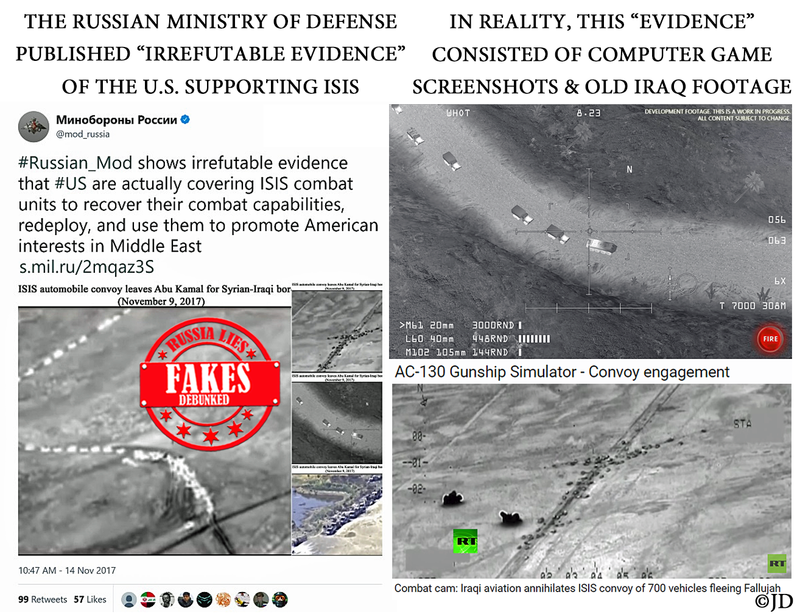 The Russian Ministry of Defense later claimed this embarrassing incident was just a “mistake,” but this is not the first instance the Russian government resorted to Photoshop or fake imagery, in order to support their baseless allegations. Russian state media claimed that a New York diner, “Lucy’s Cantina Royale,” featured a very special 5-tier burger, created in honor of Putin’s 65th birthday. 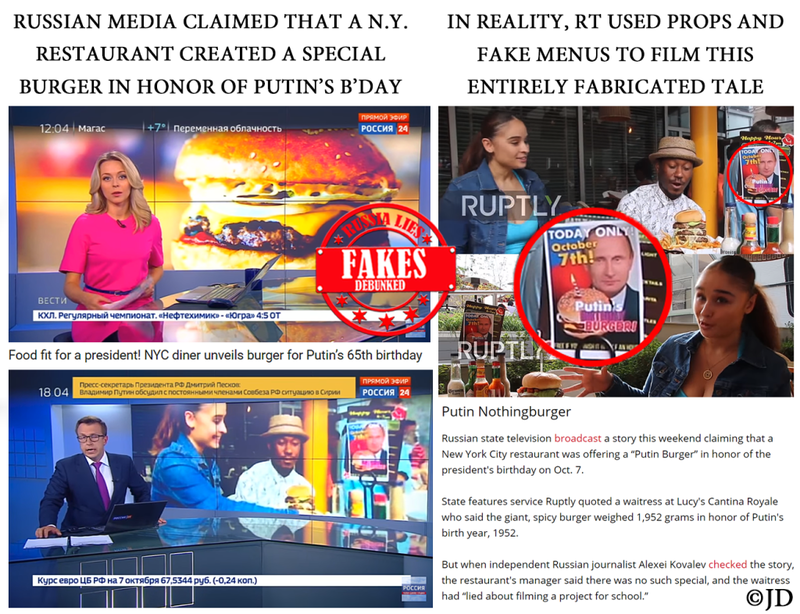 Eagle-eyed Kovalev noticed that only one table in the restaurant (the one featured by Russian state media outlet, Ruptly – part of RT, formerly known as Russia Today) featured the “Putin’s Birthday Burger” promotion. Ruptly filmed the phony burger episode one day earlier than the date listed on the fake promotional materials, which suggests its direct participation in staging the hoax. 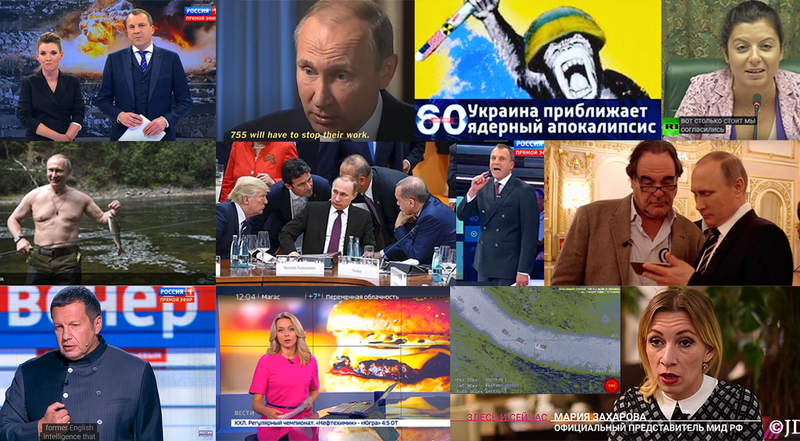 Odious Russian propagandist, Vladimir Soloviev, didn’t stay out of the fray in his zeal to boost Putin’s perceived international status. 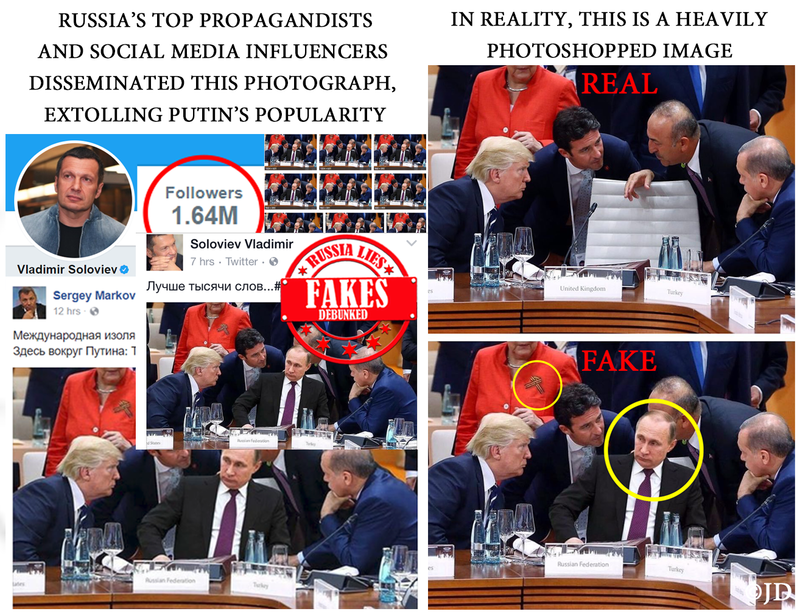 Soloviev proudly shared a Photoshopped image of Putin, surrounded by seemingly fawning world leaders, with his 1.64 million followers. Continuing the theme of Putin’s awe-inspiring popularity all over the world, Russian state TV claimed that Western media admired Putin’s remarkable physical shape. In reality, the article was simply misquoted. 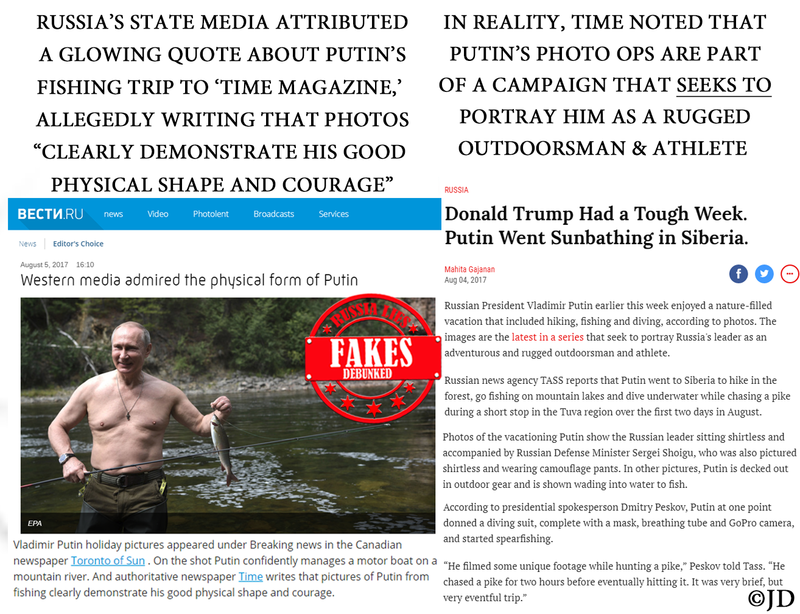 It stated that by staging shirtless photo-ops, Russian state media sought to portray Putin as a rugged outdoorsman. RT’s editor-in-chief, Margarita Simonyan, blamed Twitter for RT’s election ads, which were cited as a part of Russia’s interference in the U.S. election. 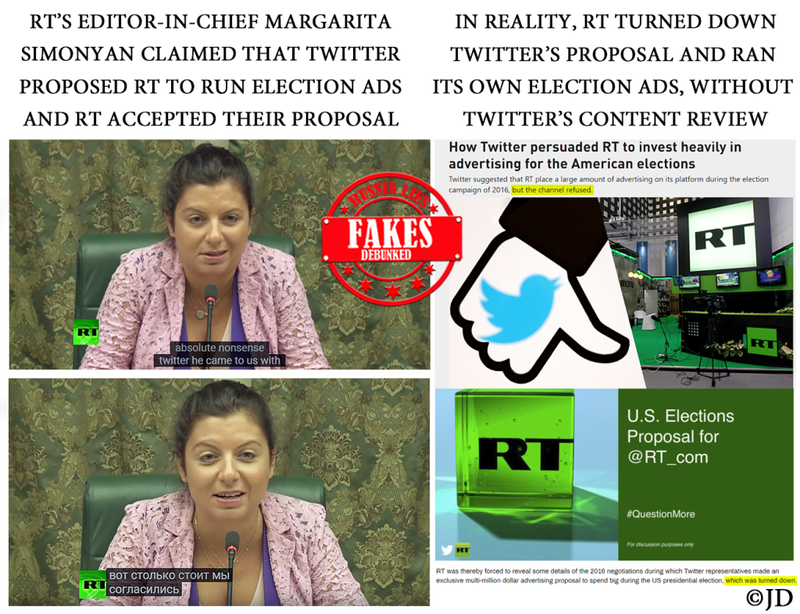 While testifying before Russia’s Federation Council, Simonyan claimed that Twitter approached RT with a proposal to run election ads – and RT accepted. That claim certainly made it sound like Twitter not only came up with the whole idea, but also signed off on the content of the ads. In reality, RT was not entrapped by Twitter. The network eventually admitted that it declined Twitter’s proposal and ran election ads of its own accord, without Twitter’s editorial participation. While appearing on Russian state television, RT’s editor-in-chief, Margarita Simonyan disingenuously claimed that RT is not being allowed to work in the U.S. 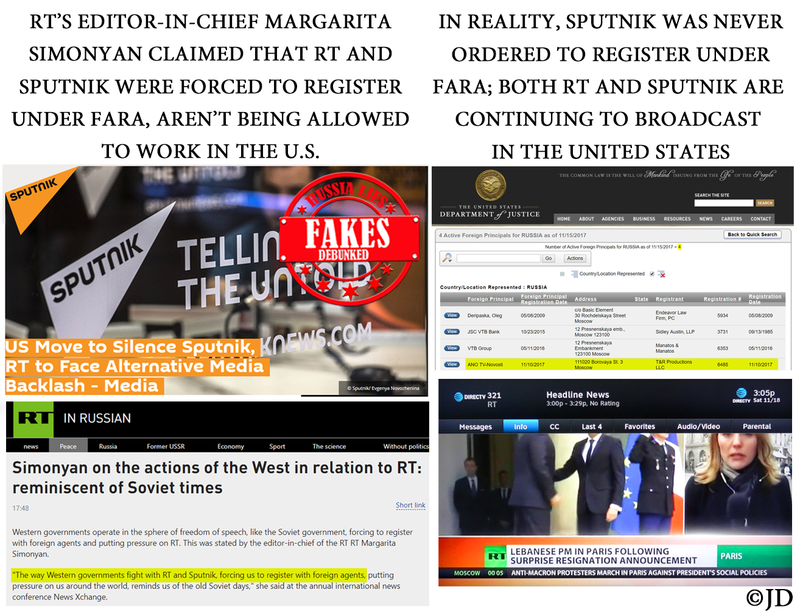 Likewise, RT’s sister outlet, Sputnik, alleged that the U.S. moved to silence Sputnik and RT. In reality, FARA registration of RT’s shell company (T&R Productions LLC) and its one and only member (Mikhail Solodovnikov) didn’t seem to have any negative impact on RT’s or Sputnik’s ability to work/broadcast in the U.S.
During one of Putin’s interviews with Oliver Stone, Russian President mentioned the long-debunked tale of Carlos – a nonexistent Spanish air traffic controller, who supposedly worked at Kyiv’s airport. 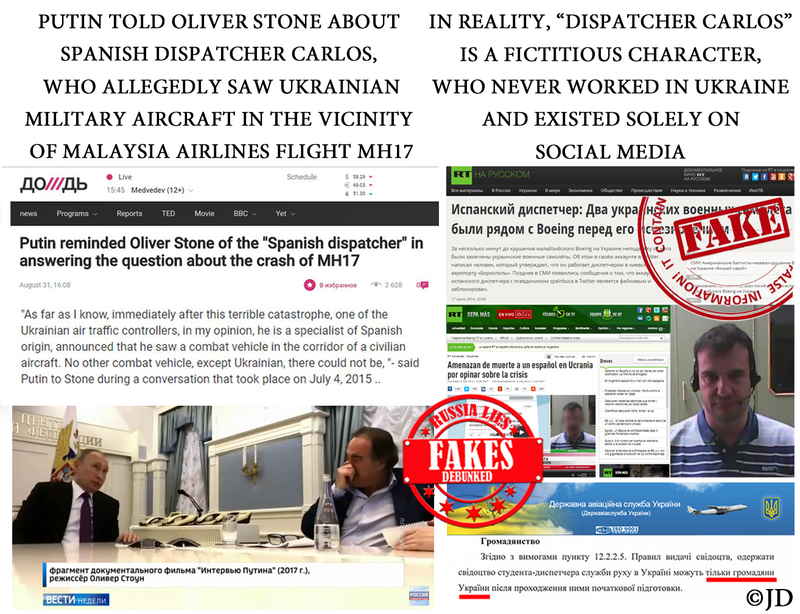 Putin repeated the well-known fabrication that “dispatcher Carlos” witnessed two Ukrainian fighter jets near Malaysia Airlines Flight 17 shortly before the airliner was shot down. In reality, foreign citizens are not allowed to work as Ukrainian air traffic controllers. “Carlos” existed only on social media. Putin was either ignorant of the fact that this fable had been previously debunked, or willfully repeated a knowingly false piece of propaganda. 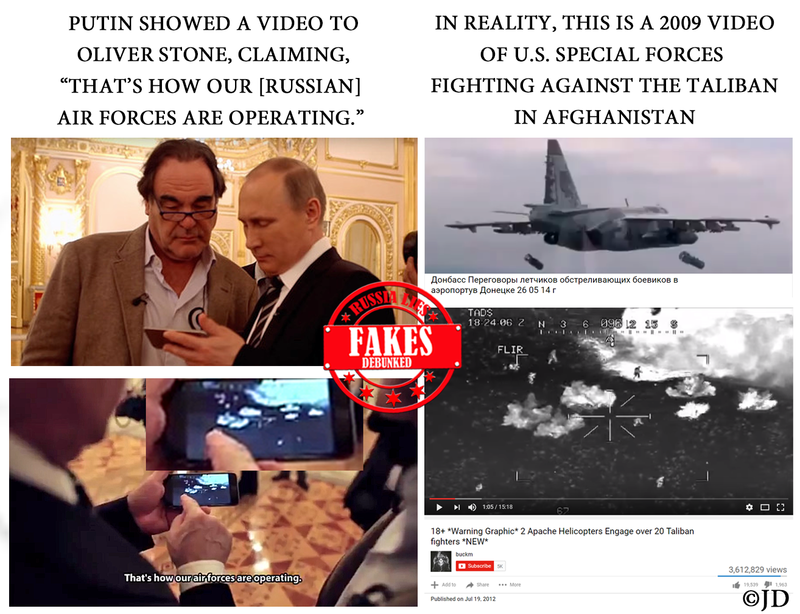 During the filming of Oliver Stone’s ode to Putin (masquerading as a documentary, ‘The Putin Interviews’), Putin pulled out a smartphone to show Stone the footage of Russian forces fighting ISIS in Syria. In reality, this footage from 2009 shows Americans fighting against the Taliban in Afghanistan. 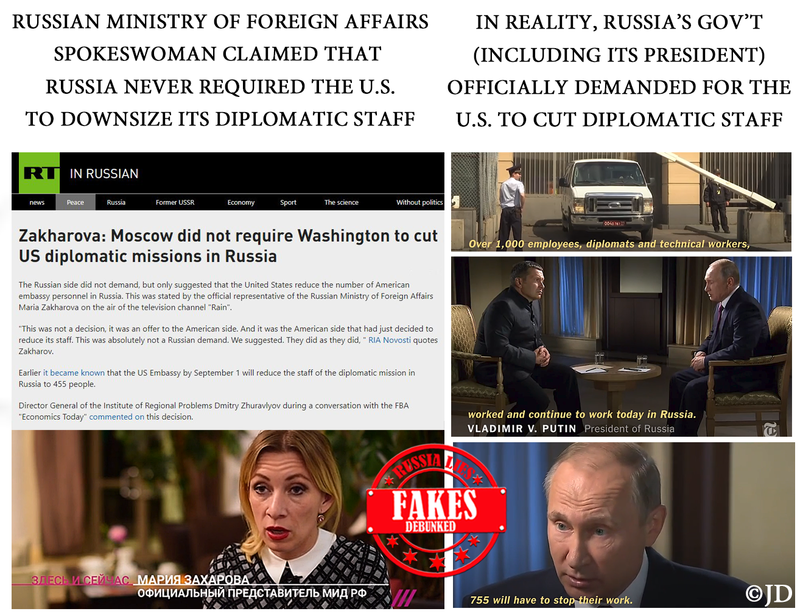 In spite of being exposed as an obvious lie, the Kremlin asserted that the footage came “from a report from the Ministry of Defense which was given to the President,” and therefore must be real. Russia’s Ministry of Defense continues its embarrassing charades on the world stage, even at the expense of the Russian President – who is either clueless or complicit. 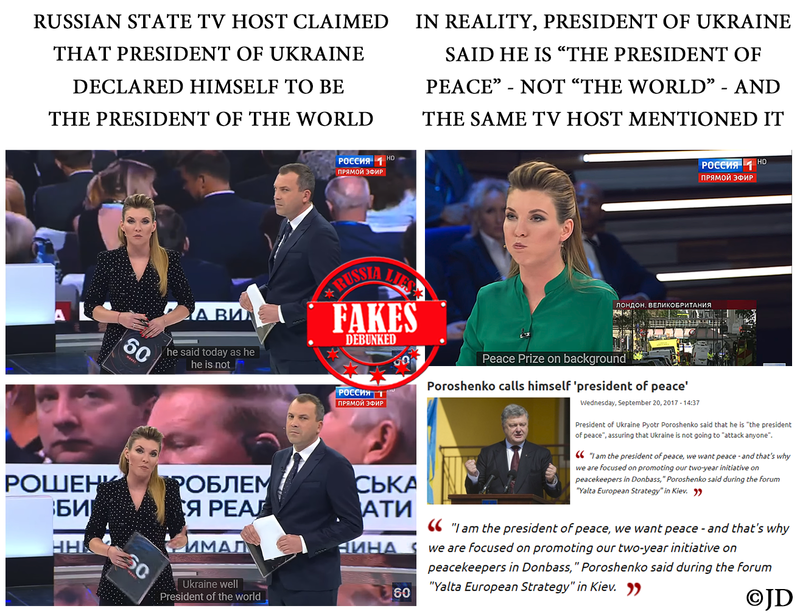 Russian state TV host, Olga Skabeeva, claimed that the President of Ukraine declared himself to be “the President of the world.” “Why not the whole universe?” – Skabeeva scoffed. Of course, Skabeeva wasn’t simply mistaken. In fact, in an earlier show she used the correct translation of Poroshenko’s words: “I am the President of peace. We want peace.” In the previous show, Skabeeva said that with his aspirations for peace, Poroshenko might be setting his sights on the Nobel peace prize, like Obama. When Ukrainian panelist, Roman Tsimbalyuk, pointed out Skabeeva’s mistranslation in the latter show, she wasn’t surprised or embarrassed. In fact, Skabeeva grinned with satisfaction. That, in a nutshell, is the mindset of an unabashed Russian propagandist. They sell a lie with pleasure and experience no shame when caught. Russian propagandists had a field day with the NY Times article that quoted “missile expert” Michael Elleman, suggesting that North Korea’s rocket engines may have come from Ukraine – “probably illicitly.” Elleman later claimed he was misquoted, as the possibility the engines came from Russia – not Ukraine – cannot be excluded and is, in fact, more likely. In reality, there is no factual basis for such assertions. 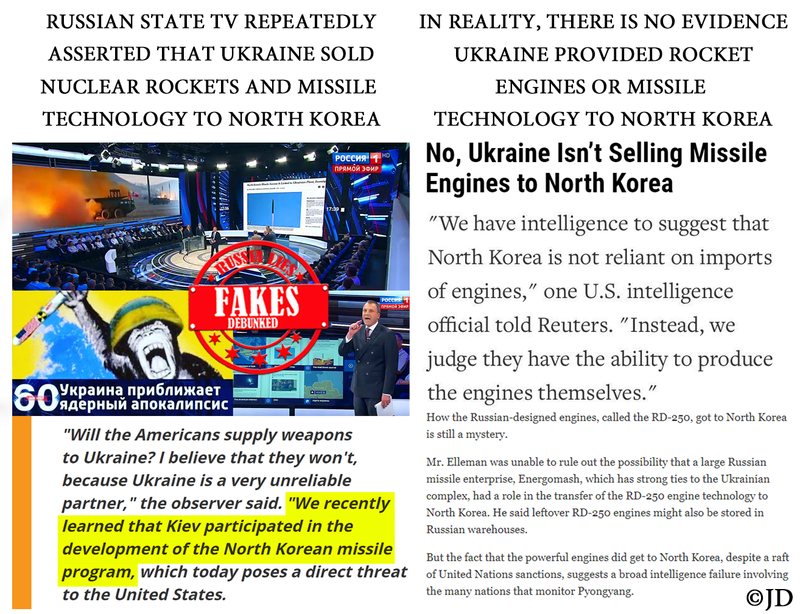 There is absolutely no evidence that Ukraine divulged nuclear technologies or supplied rocket engines to North Korea. Furthermore, experts agree that North Korea likely has an independent ability to make missile engines, without relying on imports. 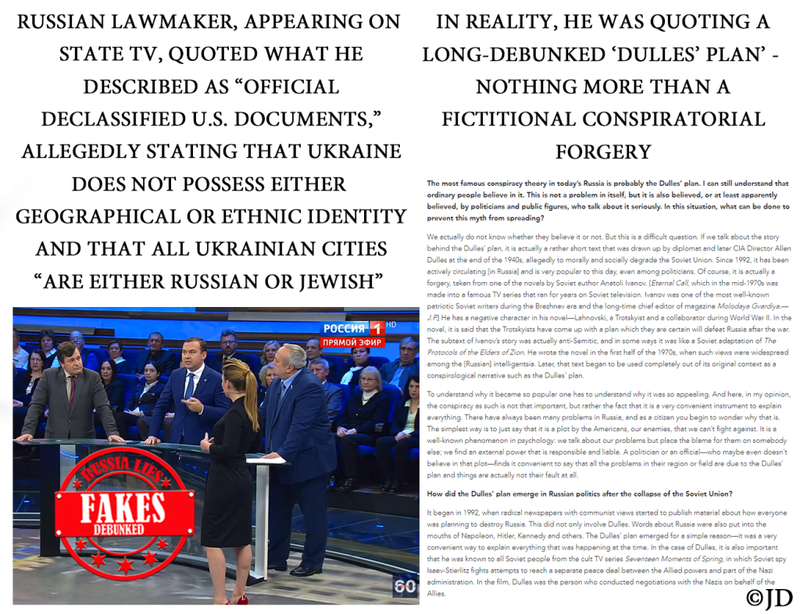 During his appearance on Russian state TV, lawmaker Yuri Afonin claimed to be quoting official declassified U.S. documents, allegedly stating that Ukraine doesn’t have any geographical or ethnographic identity, most Ukrainian cities are Russian & Jewish. In reality, Afonin was citing a long-debunked “Dulles’ Plan”- a fictional conspiratorial forgery, according to which the CIA chief Allen Dulles allegedly sought to destroy the Soviet Union. Regardless of how many times such conspiracies are debunked, Russian political elites and state media continue to repeat them as indisputable facts. 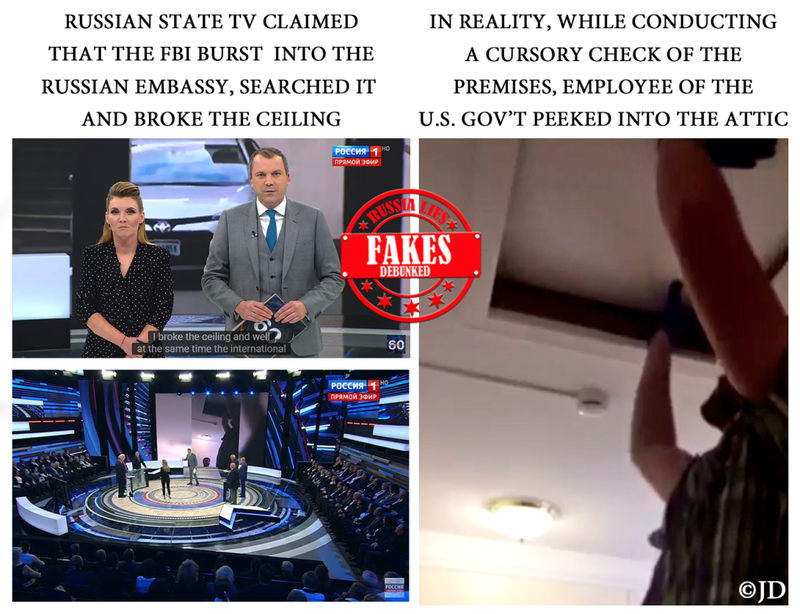 Russian state TV claimed that Trump administration “forced Russian diplomats to hurriedly burn documents in their fireplaces” and then forcefully searched the Embassy, “breaking the ceiling and international law” in the process. In reality, Russian diplomats made their own decision to burn unspecified documents in the fireplaces of the former Russian Embassy, closed down by the Trump administration. During cursory inspections of the building that was ordered to be vacated, no one broke any ceilings – in fact, U.S. government employee simply peeked into the attic. In reality, Putin sounded pretty categorical, when he said that 755 members of the U.S. diplomatic staff in Russia will have to stop working there. 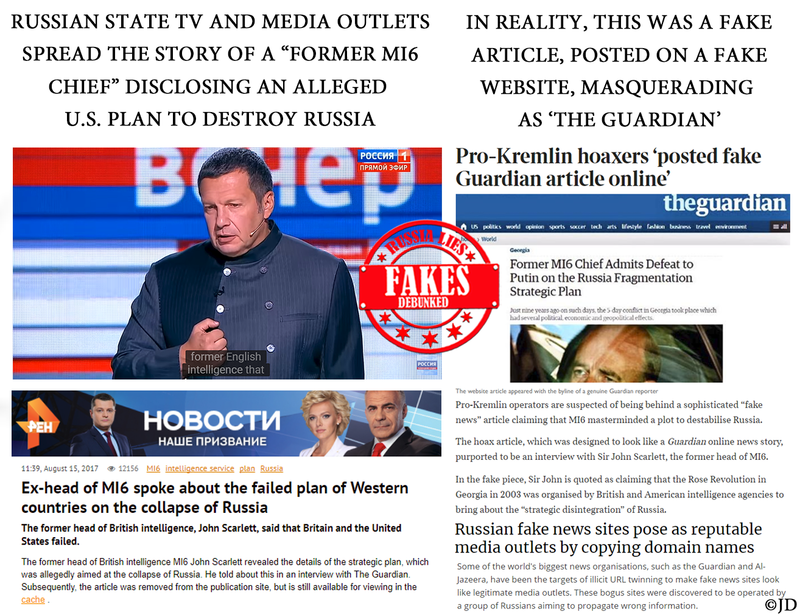 Pro-Kremlin hoaxers created a fake news article, claiming that MI6 masterminded a plot to destabilize Russia. The piece was deliberately designed to look like a Guardian article, masquerading as an interview with the former head of MI6, John Scarlett. He was quoted, allegedly disclosing a secret NATO plan to bring about the “strategic disintegration” of Russia, taking control of “all of Russia’s shores, along with the Black Sea”. 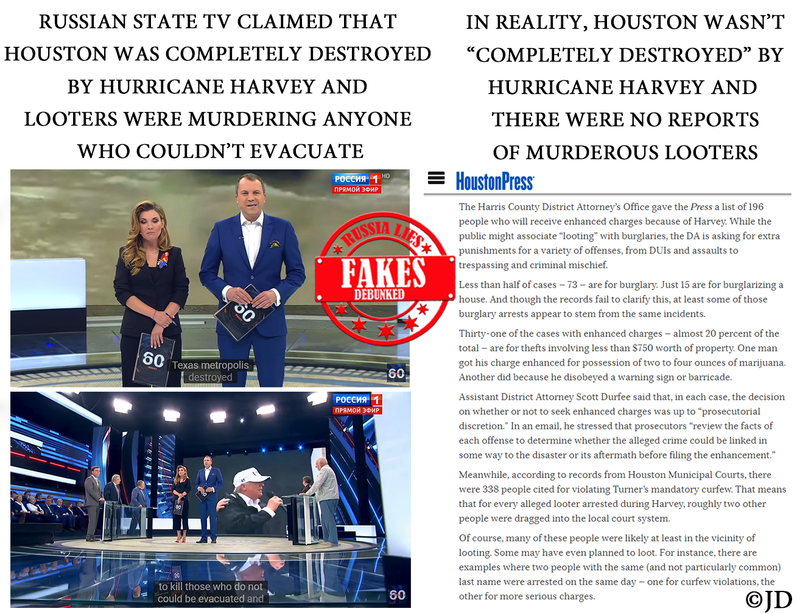 In spite of being debunked (in English and Russian language), the hoax was widely reiterated and quoted on Russian state TV and other Russian media. 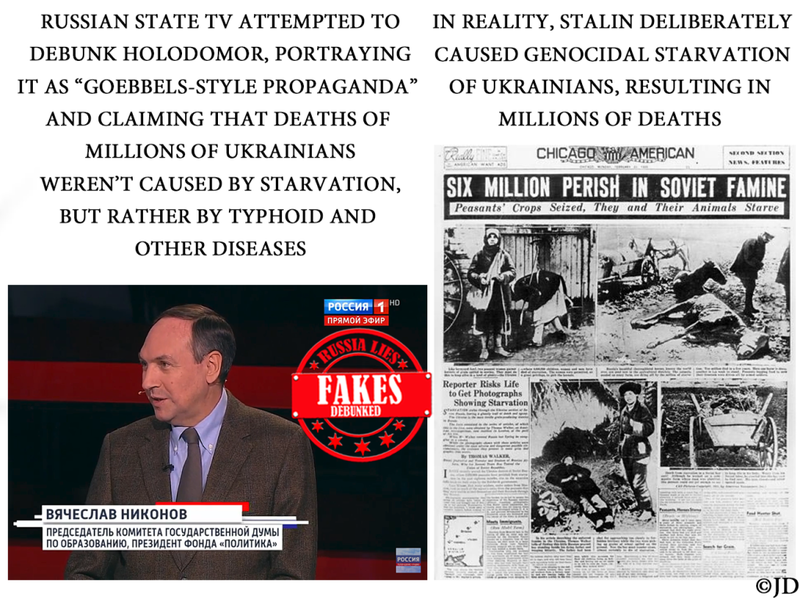 Appearing on Russian state television, lawmaker Vyacheslav Nikonov – the Chairman of the Education Committee – claimed that Holodomor – genocidal starvation that claimed the lives of millions of Ukrainians – didn’t really happen. Nikonov callously danced around the issue, claiming that mass deaths weren’t caused by hunger, artificially imposed by Stalin, but instead could be blamed on typhoid and other diseases. He went so far as to compare Holodomor to Goebbels-style propaganda. Needless to say, Holodomor is an established historical fact, a horrific genocide of millions that cannot be whitewashed, in spite of Russia’s continued attempts to do so.